Yesterday, the campers arrived and we helped the check-in process. Some of us directed campers to their rooms while others checked through bags for any prohibited items. The camp is grouped into four teams (Rojo, Amarillo, Azul, y Verde) at the beginning of move in day and many were excited to see the volunteers from the Estados Unidos also be divided into teams. After an introduction chapel, the campers had a game time, which we volunteers tested out beforehand. The great thing about playing games is that language barriers almost don’t exist. We broke up into small groups afterward to create a team cheer and mascot. However, only a few groups had a team translator (or student comfortable with Spanish). This made it hard to participate in creating the cheer and many of us felt the desire to have learned Spanish before coming to Bolivia. Even with broken Spanish, which some of us could use (Gracias, Professor Klotz), it was hard to keep up with the entire group of 31 or so campers on each team. After dinner, we met again with all the teams in the chapel and watched a movie that introduce the theme (Des Zombie = De-Zombie; a play on the addictive nature of technology and social media). The media was incredibly well-done and the kids seemed to really enjoy it. A speaker also gave a message about pitfalls of destructive habits (connected to technology). Early this morning, we began the day with the campers participating in group aerobics. After breakfast, we went with the Bolivian volunteers to set up a multi-tiered race while the kids were in chapel. Each of us were at different posts along the path. Two campers from each team had a cart in which one rode while the other pushed. They had to race around the track in the shortest amount of time while completing or avoiding obstacles. 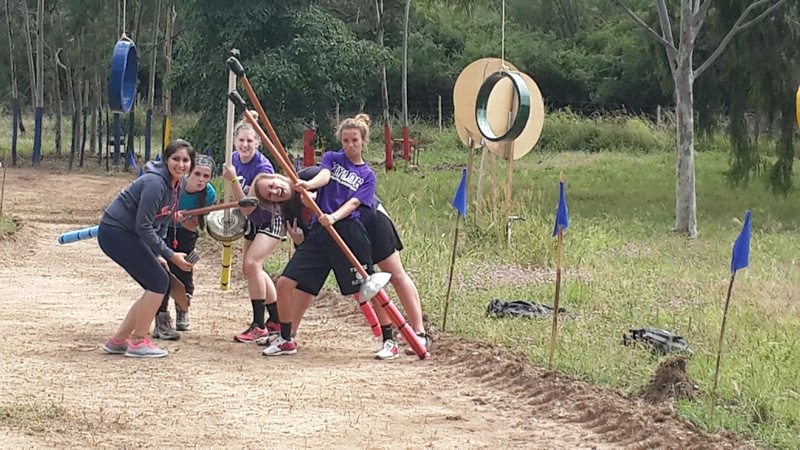 Some from our team helped with jousting while others set up swinging tires, lances, and water balloon targets. The teams are much more competitive than we expected and love to get hyped with cheers they hand wrote yesterday. This afternoon, we will be setting up for the banquet and also running the obstacle course and famed mud pit, which all volunteers must brave for their initiation into Monte Blanco. This obstacle course is the same that we cleared earlier in the week, for which we will be thankful as we watch the campers run through each section. Personally, Kelsey and I (Ashlee) are pumped to slosh through some Bolivian mud and see if it is really as fun as the videos show. This is the climax of the activity portion of the camp and after the banquet, we will all hike up to the fire pit for some songs and ministry. Strategically, Tim has told us that in order to break down barriers, the kids must first enjoy fun activities and good food without being pushed to make a life change for Christ the first day. The campfire time offers an intimate setting in which the campers will have the opportunity to hear the gospel like never before and personally choose Christ. While it promises to be a long night ahead, all of us are excited to see how God will touch their hearts tonight.